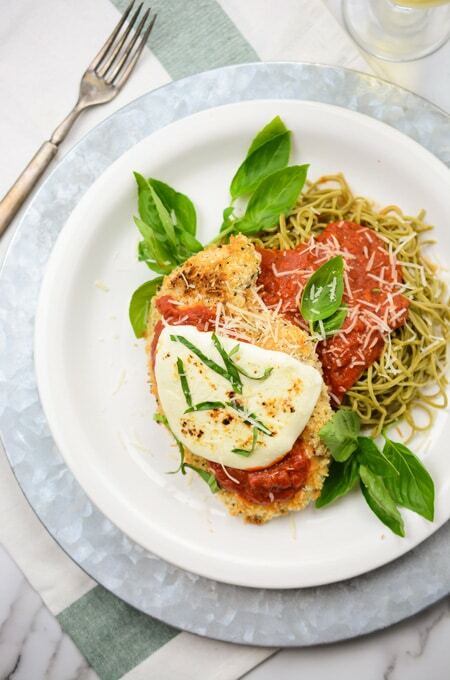 This Weeknight Baked Chicken Parmesan will have dinner on the table in about an hour! 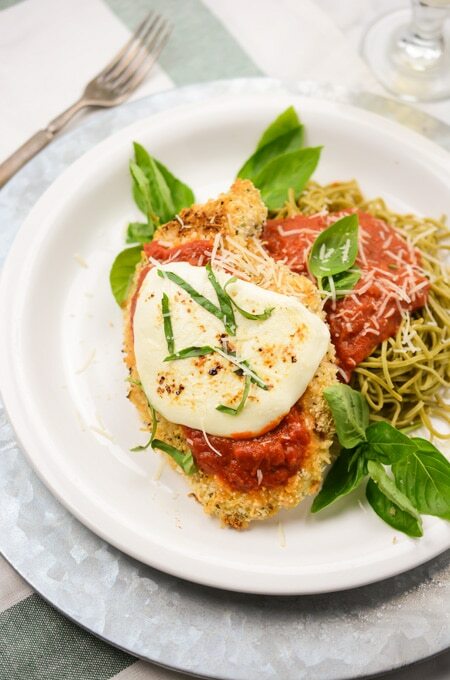 Small price to pay for an Italian seasoned, Panko and Parmesan crusted chicken breast topped with marinara sauce, mozzarella cheese and fresh basil! Plus. 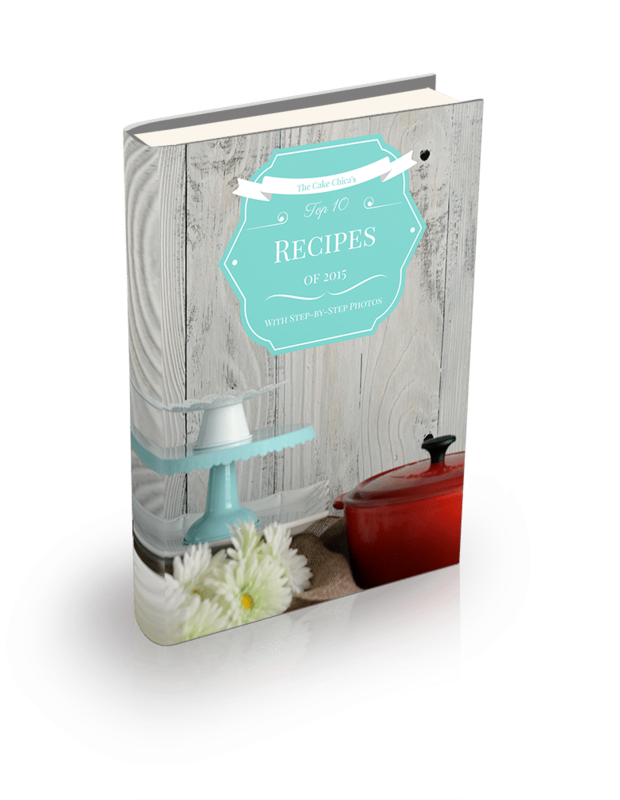 I’ve included some great tips on how to get your crust to adhere to your chicken every time! Keep scrolling down to find out how! Since this recipe uses a jarred marinara sauce I paired mine with some edamame pasta and of course some white wine. Dipping the chicken in flour first will help the egg wash cover the chicken better. The egg wash then helps the breadcrumbs adhere. Adding a little water to the egg will help the egg slide off the chicken better. An egg by itself would be too thick. If time allows, once the chicken is prepped and ready to stick in the oven, leave it on the counter to hang out for about 10 minutes. Have a few more minutes? Stick it in the refrigerator for about 30 minutes. This will set the crust nicely. 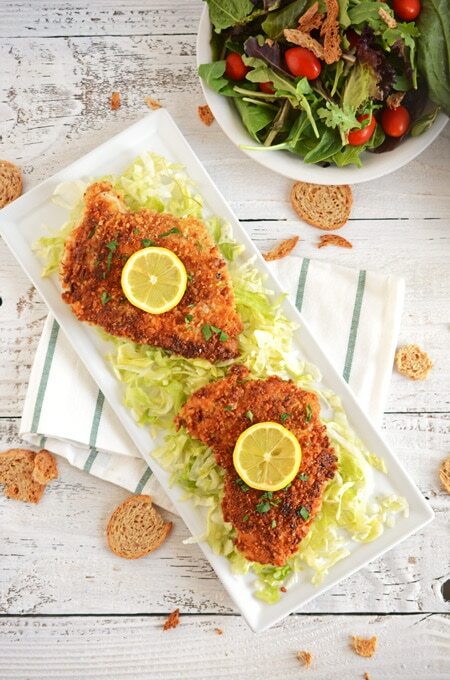 This post was inspired by Erin’s recipe for Baked Parmesan Chicken over at Well Plated. 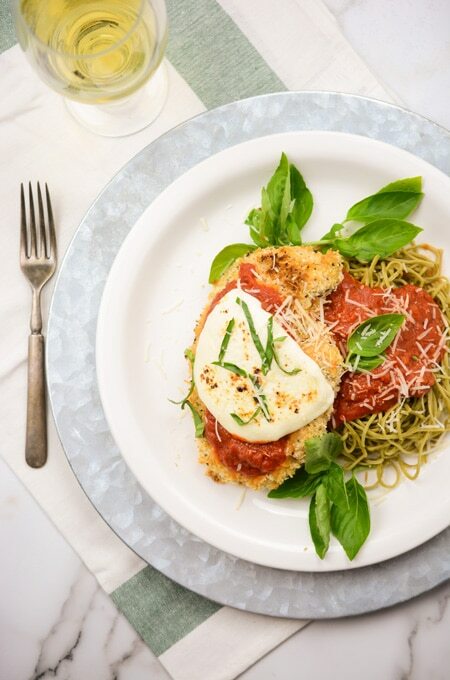 Panko crusted chicken breast, topped with marinara sauce, mozzarella cheese and garnished with fresh basil. Heat oven to 350 degrees. Line a rimmed baking sheet with foil and place a baking rack inside. Spray baking rack with non-stick olive oil spray and set aside. Pat chicken dry with paper towels. Cut each chicken breast in half length wise. Salt and pepper both sides of the chicken breast. In a pie dish or shallow pan, add the flour and set aside. In a second pie dish or shallow pan, add egg and water and whisk to combine. In a third pie dish or shallow pan, combine the breadcrumbs, Italian seasoning, Panko breadcrumbs, Parmesan cheese and garlic powder. Dip chicken breast one at a time into the flour on both sides, shaking off the excess flour before dipping into the egg mixture. Dip chicken breast into the egg mixture on both sides, letting the excess drip away from the chicken breast. Next, dip the chicken breast into the breadcrumb mixture on both sides, gently pressing on each side to adhere the breadcrumbs. Set chicken on prepared baking sheet. 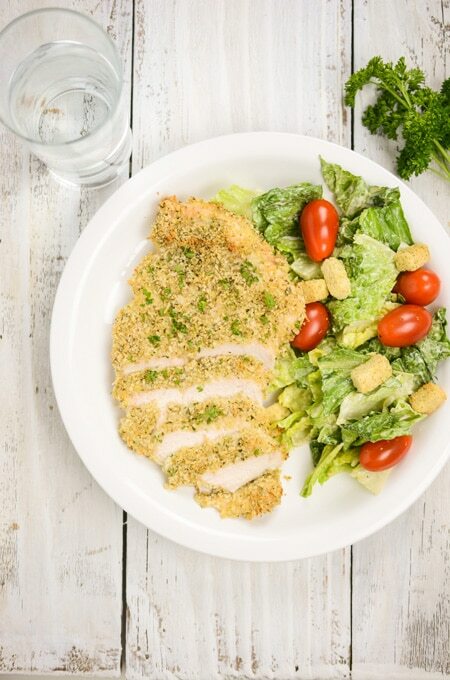 Repeat this process with remaining chicken breast. Bake chicken for 30 to 35 minutes or until the chicken registers 160 degrees. 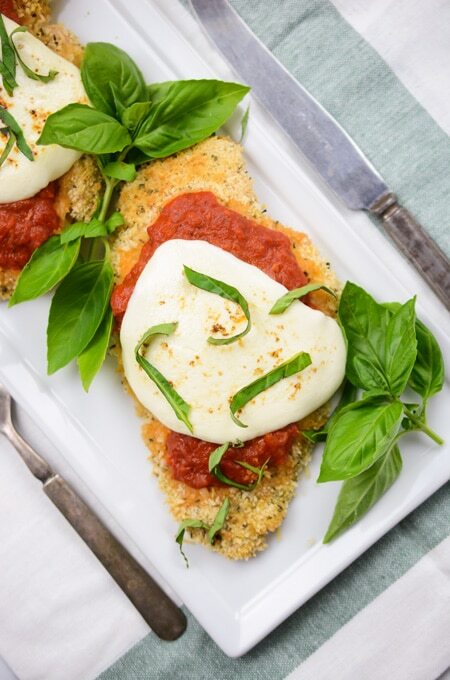 Remove chicken from the oven and spoon ¼ cup marinara sauce on top of each chicken breast. 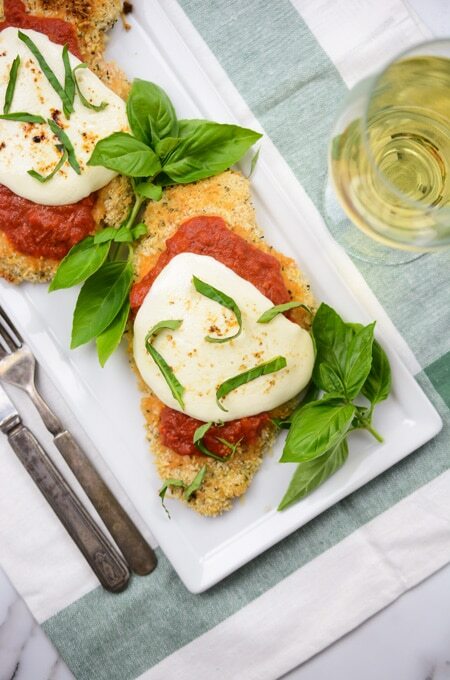 Then, top with one slice of mozzarella cheese on each chicken breast. Return the chicken to the oven and bake for about 3 to 5 more minutes. Alternately, you can use the broiler to brown the cheese a little more, but watch closely. The cheese can burn quickly using this method. 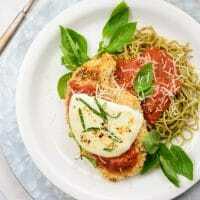 Top with fresh basil and serve.